My name is William Castle, but you can call me Bill. You’re not afraid of a dead man, are you? Did you know that I began my career on Broadway as very young man, but soon became fascinated with Hollywood? I met a man named Orson Welles who changed my world forever. Not only did I become enthralled with his creative genius and his love of story telling, but also his addiction to cigars. 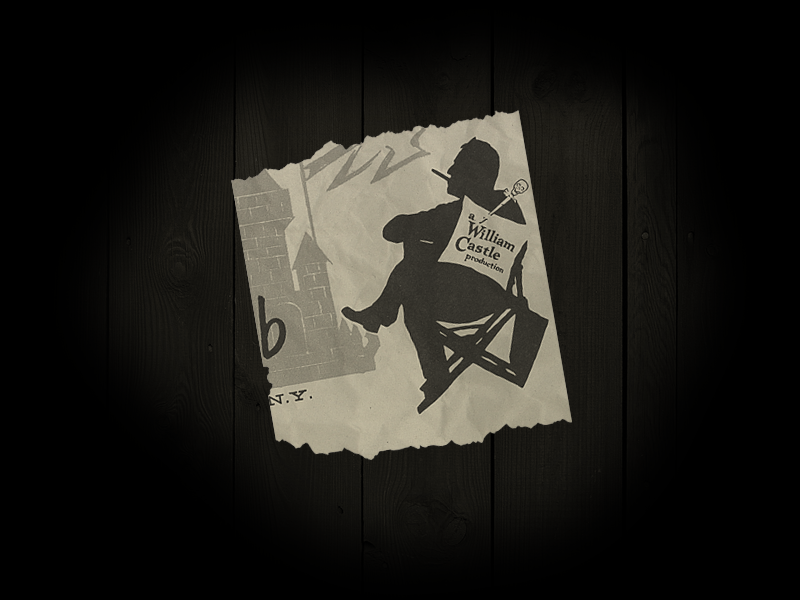 It wasn’t long before a young boy born William Schloss changed his name to William Castle and began to work under contract with Columbia Pictures. I quickly learned the film making trade and knew that I wanted to create my own brand. William Castle had to stand for something unique. I went to work to assure that a William Castle film was not just another movie, but something original. I woke up in a sweat one hot Los Angeles night and knew that I wanted my films to be the very first interactive movie experience and I wanted to scare the pants off America. I created gimmicks to make my films original, scarier, a reason to be remembered. I tingled your butts in “The Tingler” with William Castle’s PERCEPT-O. I had Lloyds of London insure each movie-goer against ‘Death by Fright’ in “Macabre.” I created William Castle’s EMERG-O for my “House on Haunted Hill.” But I didn’t stop there. No, I was having too much fun. I couldn’t help myself when I made my first ghost viewer and the result ended with the fantastic William Castle’s ILLUSION-O, an integral part of the “13 Ghosts“ filmic experience. Those were the days, the days before I produced a film called “Rosemary’s Baby.” I’m not sure I should have ever played with subject matter so dangerous. The world of William Castle changed after this successful film. It is a masterpiece of film and a legend for horror buffs. To me, it represents evil. It premiered in 1968. The world changed after this film and so did I. But that was then. Now William Castle is dead and buried. Or so you think. But I couldn’t resist the opportunity to come back “From the Grave” and begin scaring a whole new generation. William Castle will write and produce “From the Grave” if I can find an audience not too afraid to watch, listen and read the musings from a man who has been dead since 1977. Perhaps it will be you. That is, if you dare!